How much delight can one room stand??? This comes up at every consult. What the heck to do on the ceiling? Common practice says paint it in Ceiling White in a Flat finish. This technique guarantees the ceiling to be pretty much a non-entity. In some rooms, where there is a lot going on and one wants absolutely no distraction happening on the giant wall above the room, it is correct to use Ceiling White in a Flat Finish. A moment ABOUT WHITES: There are more than 100 whites and off-whites in the Ben Moore paint palettes, not to mention the Williamsburg colors and the Affinity palette!!! A white I love for that 5th wall above your head is Simply White OC-117, which works well with everything. It has a warm brightness happening. It’s not gray. A gray undertone could lead you to White Dove OC-17 or Decorator’s White PM-3. For warm, creamy ceiling and/or trim color, I like Mascarpone AF-20 or Capitol White CW-10. For a cool white, check out Frostine AF-5. The purest, most white white is Chantilly Lace OC-65. It’s very bright!! So unexpected and glorious. It pays to be aesthetically brave. 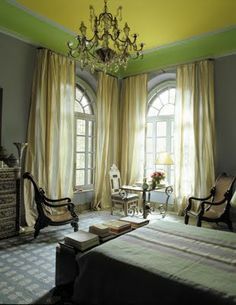 ABOUT COLOR on ceilings: I’m a color girl and any chance I get to include the so-called 5th wall of a room in the design and beauty of the color scheme, I take it. The Navajo prayer about walking in Beauty includes a phrase about the beauty happening above you. 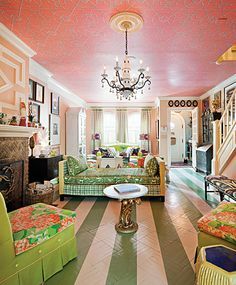 There are examples of color on ceilings on my Pinterest board specifically about this crucial topic. Every room has its magic. Sometimes a subtle color is best. Sometimes deep and rich is the way to go. You get to choose. Be brave.